In my first jewelry classes, more than 15 years ago, I ordered some silver. I spent a whopping $25 and that amount was so precious to me. But where did this silver come from? I asked my teachers where the silver originated and got some vague answers - Arizona? New Mexico? (Mildly true, since that’s where my main supplier of raw materials is based). The mine and source of the metals was not commonly known to my teachers (maybe you had teachers who taught you this, if so - lucky! ), wasn’t taught as part of the curriculum, wasn’t published in the supplier’s catalog, and wasn’t disclosed anywhere on their website. I persisted and kept asking different people, but it wasn’t until 2005 that I started to get answers. Thanks to organizations like Ethical Metalsmiths, those of us in the jewelry industry who cared now had a place to find answers.This was a great resource since bad news about mines, mercury leaching into the water and human rights issues around mining were rarely big news, unless the story was incredibly tragic. I think that many of us have this picture in our head of a miner, with a long beard, a scruffy hat and dirty clothes, leaning into a riverbed, perforated pan in hand. Maybe he’s scooping up river sediment to sift through - I know that I always like to think of him biting into a newly discovered gold nugget like in the cartoons, with eyes that turn into dollar signs. Maybe this is the way that it originally went down in California during the gold rush, and to be sure there are still places where you can go panning for gold, but methods for gold and silver mining turned far less idyllic, and far more destructive. The good news is that there has been a sweeping movement to reform mining practices and more and more suppliers are signing on to use recycled metals in their offerings. Even more modern methods and partnerships have resulted in better options for both recycled and Fairmined precious metals. Finding suppliers of recycled gold is easier than ever. With increasing transparency in the jewelry industry, more and more suppliers are signing on to use only recycled metals. In the interest of my own transparency, know that I order my Fairmined and recycled materials from Virginia-based Hoover and Strong - their refining and environmental practices are above industry standards when it comes to reducing emissions and wastewater - their practices actually ensure that no wastewater is discharged into the environment. I also order recycled metals from New Mexico-based Rio Grande, a company that uses 100% recycled metals for most of their silver and gold. What questions do you have about sourcing recycled and Fairmined metals? Hit me up in the comments! Do you remember what it was like to be a beginner? I know I do. More than 15 years ago I took my first official jewelry class. It was scary to be in a place of not knowing. I had been making jewelry as a hobby for years before I ever had my first real lesson, and I was intimidated by so many new tools in that metal workshop. And the torch! We learned on a h-u-g-e torch and I thought I was going to burn the building down. (I got over the torch thing pretty quickly because holy hell, torches are fun.) I also remember not understanding most of what my teacher said - she told us to “see how the solder flowed” or talked about work-hardening the metal, or pickling (be honest - you probably didn’t understand that sentence either). I wasn’t sure I was “getting it” at all, but everything I was learning seemed full of possibilities, and I kept loving the finished results. The point is, being a beginner is hard. We don’t all start out as experts, yet we all need to start somewhere. Why not start somewhere now? Beginning in April, you can register for one-on-one or one-on-two jewelry lessons, workshops, private customized lessons and even Craft Your Wedding Ring workshops. Work with me one-on-one, with a friend, or join me for group classes around the Bay Area. To start, you can choose from Build Your Own Stacking Rings in Silver, move on to Wax Carving for Jewelry, learn Jewelry-Making Essentials at Jenny Lemons, or even request your own customized class - stone setting, chain making, wide band rings - so many options. As for me, I pride myself on creating a non-judgemental atmosphere - there are no dumb questions and no such thing as too many questions. I’ve been making jewelry for more than 15 years and I have made my share of mistakes at my workbench. And you can learn from aaaaallll of them. For one-on-one lessons, I’ll be there to guide you safely through every step of the process and to share with you how much fun it is to work directly with silver and gold. If groups are more your thing and if you love the energy and inspiration of other students, check out our upcoming workshop at Jenny Lemons. Warning! Jewelry-making is a gateway drug into the maker world. You may find yourself getting inspired just by the process and wanting to make jewelry all the time (I know I did!). Let me know in the comments below what you’d like to learn! Want to hear more about our classes and workshops? Find out all about our next classes, lessons and workshops! We respect your privacy. We do not sell, rent or disclose your names and emails to anyone - that would be some seriously bad karma on our part. Thank you! You’ll get a newsletter or two each month announcing our next available classes, workshops and our newest class offerings. You're in love, you know you want to get married and you’re ready to propose. So you run out to get a ring, but how do you know that it’s going to fit them? A ring, unlike earrings and necklaces, isn't a one-size-fits-all piece of jewelry, so getting the size at least kinda sorta close to right is important. Here are a few helpful hints for getting things right the first time. This is probably the easiest shortcut to finding out their ring size, but it also assumes that your beloved wears a ring on their ring finger. Some women don’t wear anything on that finger before engagement or marriage out of tradition. Just keep in mind that there can be a significant size difference between the right hand and the left hand, so if you find a ring that they wear on their right hand, it may not be exactly the right size for their left hand. Option #2 - Ask her friends. There is always a chance that she’s dropped hints. Big hints. And by hints, I mean that she may have actually told her best friend (or sister, or Mom) what her ring size is. So...not really a hint. More like a giant clue that she’s left for you to find. And a pretty easy-to-find clue at that. Have they already decided which designer they’d like a ring from**? If so, then it's a good bet that your future betrothed would like something else from that same designer. Ordering something smaller and less formal is a lot less risky and can create a sweet memory for the two of you. Then you can plan together which "official" ring to get. It could even be a ring that can stack with their eventual engagement and wedding rings. Sure, it’s not exactly romantic, but maybe you guys are a couple of rule-breakers anyway. Or maybe you are both super-communicative. 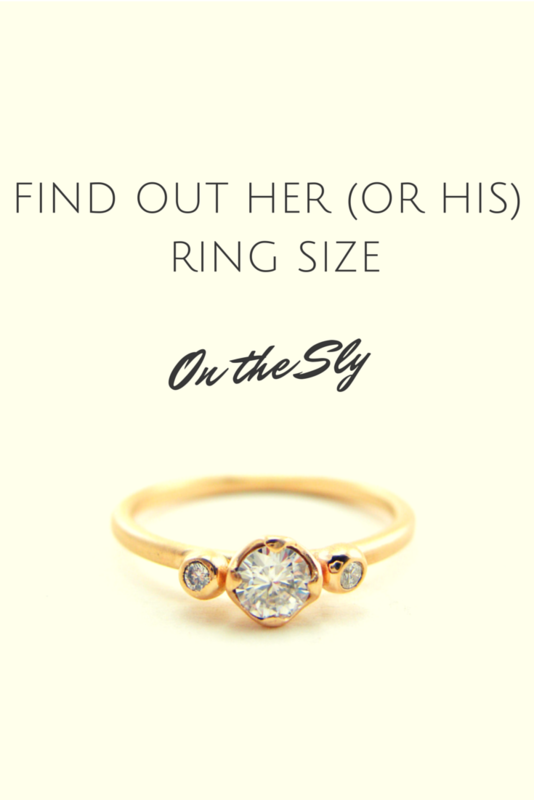 Either way, if you talk openly about your future together, asking for their ring size won’t be a downer. Besides, you don’t have to tell them when you’re planning to propose. *If they wake up and you get caught, just tell them that you were trying to hold their hand. **OK, so let’s back up for a moment and say that you have no idea what kind of ring they would like. The best place to do your secret spy research is on Pinterest. Take a look at their boards and see what kinds of jewelry they pin. There is a great chance that they already have a board totally dedicated specifically to engagement rings. And when in doubt, ask their friends. I'll admit it - I got into jewelry-making largely for my own self-interest. I wanted to have beautiful pieces of jewelry to wear and the best way to get something that's exactly what I want is to make it myself. So I started making jewelry. A lot. Obsessively. All the damn time. Time passed, more jewelry got made and I got more curious about where my metals came from. I got more interested in creating a jewelry line that uses sustainable materials and incorporated more designs and more creative and wild visions. Each year, I make more and more jewelry that I love down to its core. It becomes pretty hard to figure out which pieces to put on each day when I feel like I have an embarrassment of riches. So much to love...so little ear space. I love how tiny studs accent the ear like a sprinkle of stardust. All the more so when those studs are made in rose gold. (14 karat rose gold is my not-so-secret favorite metal to wear). Though if yellow gold or platinum are your jam, by all means go to town and create your own ear party! Sure, you can wear our spear huggies on their own, without any other earrings and they will still look great alone, but this was far too fun of a look for me to pass up and adding in all of these studs feels like I’ve armored up for the day. We’d love to hear from you and see how you arrange your ear party! Feel free to post a comment or reach out to us by email. We’ll post your image to our Instagram feed and tag you too! How do you like to wear your tiny studs and huggies? *I had mine pierced by Perry at Rose Gold in the Haight. Hint: It's not an allergy. A few years ago, I thought I was developing an allergy to silver and gold. Almost overnight, my skin was turning black underneath my rings and I couldn't explain it. The answer? Science! At about the same time that my skin started turning colors, I had started using a mineral sunscreen* containing zinc oxide. Zinc Oxide, in its non-nano state, is a fantastic and safe sun-blocking agent as well as a common ingredient in many cosmetics. I am pretty obsessed with my skin care (though you wouldn't believe it if you saw my hands. Ah well, such is the jeweler's life). Zinc oxide is also, as it turns out, a very mild abrasive. Veeeery mild. But gold and silver are soft metals, so the mild abrasive in my sunscreen was actually rubbing off minuscule particles of metal from my rings and these particles transferred to my skin and appeared black. My solution? Well, I wasn't going to discontinue using my sunscreen nor would I stop wearing rings and the problem goes away when I, you know, wash. My. Hands. I also wait to put on rings until after I've applied the sunscreen and washed my hands. Sometimes the simple solutions are the best. And don't forget to clean your jewelry to get rid of any residual make up, soap, sunscreen, etc. Here is our Step-by-Step guide to safely cleaning and caring for your jewelry. And now, please resume wearing all of the rings. It brings me so much joy to be able to create custom engagement and wedding rings for my clients; more so when they seek me out because of my commitment to sustainable practice. Such was the case with a couple all the way from Amsterdam. Ronald and Christina had been looking for a ring that fit their aesthetics and their values. They both were looking for something a little more modern, a little more handmade and, of course, ethical. Ronald got in touch with me via email and we quickly realized that we were on the same page about what they wanted for her ring. 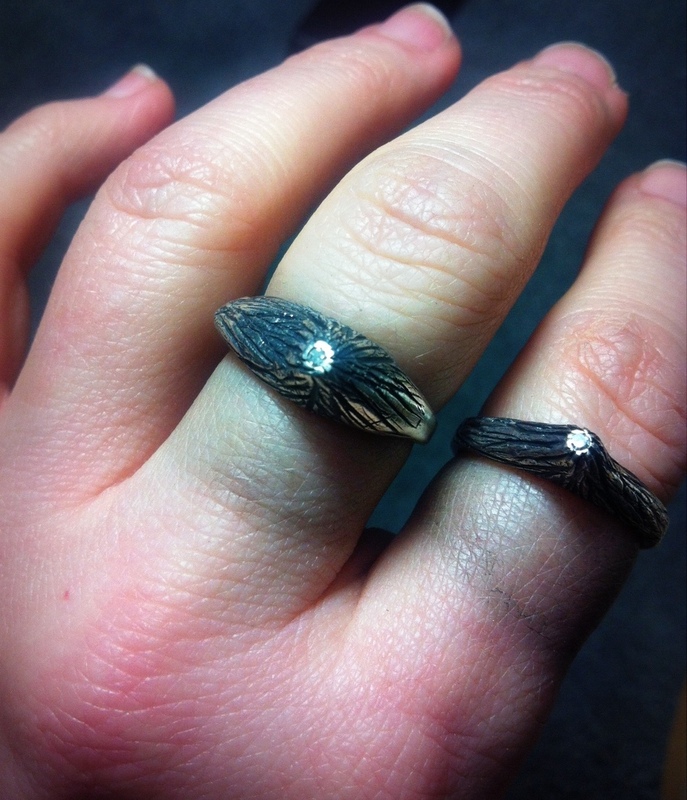 It had to be Moissanite; Christina is committed to making their lives more sustainable. She also wanted something with more subtle textures and not too large since she has small hands. 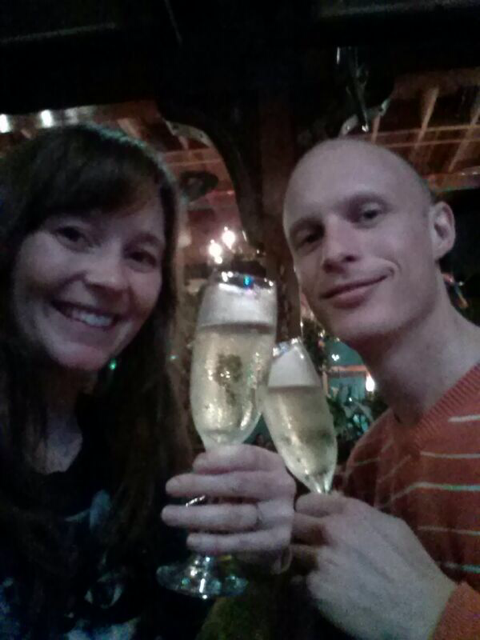 The verdict - she said yes! They graciously sent me the picture from the night that they got engaged and some lovely images of her wearing her ring in the sunlight. I love it when customers seek me out for my commitment to sustainable practices. It makes me that much more grateful that I get to do what I do.